A contingent of the Super Eagles will depart for Morocco, today, to honour the last Group B match of the African qualifying series, against Les Fennecs of Algeria. The match is slated for Constantine. The group has already been won by Nigeria, which amassed 13 points to secure the sole ticket to next year Mundial in Russia, with a match to spare. Speaking to The Guardian yesterday, the Super Eagles’ Media Officer, Toyin Ibitoye, said all arrangements towards having a successful outing on November 10, in Algeria had been made. “The contingent will be travelling out at about 5 a.m. tomorrow (today). The players invited will be the only one to travel with us, while others will join us in Morocco. “Camp opens from tomorrow (today) and it is expected that by Tuesday everybody should have arrived in the camp. 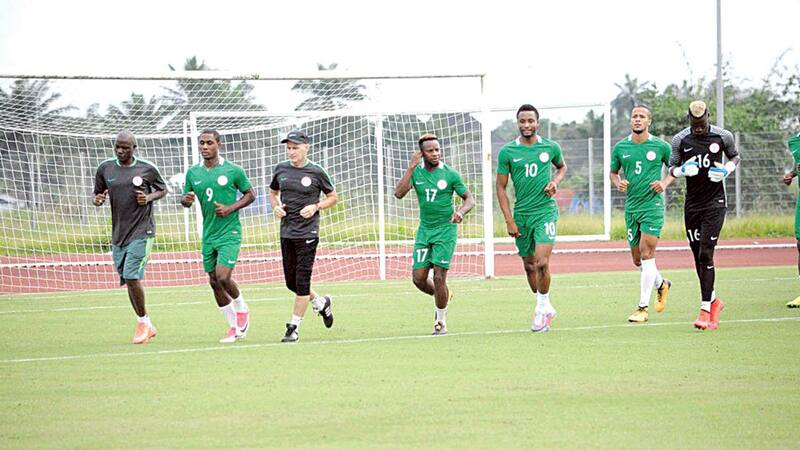 Odion Ighalo is the only one exempted due to injury. We don’t pray for any more injuries,” he said. While reacting to report of Eddy Onazi’s latest injury, which occurred yesterday during a league match between his club, Trabzonspor and Kayserispor, Ibitoye said: “We have to wait for the official word on that. If he cannot make it, it means the coach will decide on what next to do. But there is nothing official on his injury yet,” he concluded. Reports, yesterday claimed that Onazi could only managed 40 minutes on the pitch after sustaining an injury. President of the Nigeria Football Federation, President Amaju Pinnick, said despite qualification for the World Cup, the game against the Algerians would be taken seriously.